Have you ever been to a traditional Hoe-Down? If you answered ‘yes’, have you been to a traditional Hoe-Down inside of a mall? 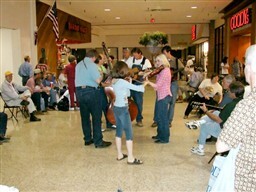 Mountain View Mall in Ardmore, Oklahoma hosts regular Hoe-Downs in the mall’s hallway during the mall’s opening hours. There’s also frequent live entertainment (mostly country and folk music) and every year the city of Ardmore holds its birthday party in the mall and offers up free cake to anyone with a sweet tooth. Sounds like a fun place, right? Mountain View Mall is a small, 216,000 square foot enclosed shopping mall anchored by JCPenney, Rex Audio-Video- Appliances, Stage Stores, Hobby Lobby, and Goody’s family clothing. The mall is a basic dumbell shape connecting JCPenney on the south side of the mall to Hobby Lobby on the north side. CVS/Pharmacy and Staples office supplies are attached onto JCPenney; however, neither has mall access. The mall’s ancillary stores include national chains such as Bath and Body Works, Famous Footwear, GNC, and some local stores. 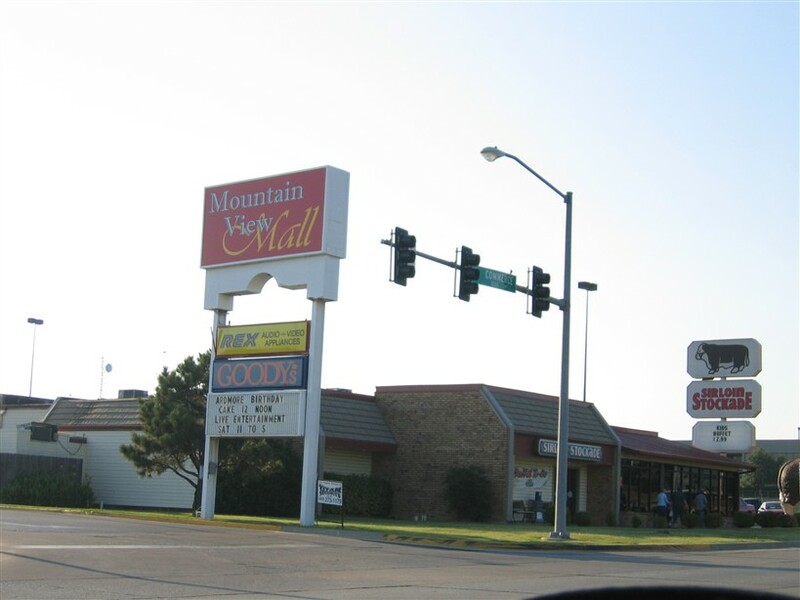 As Mountain View Mall is not large, it is still the only regional enclosed mall between Oklahoma City and the Dallas-Fort Worth Metroplex. Ardmore currently has about 25,000 residents and lies along the busy Interstate 35 corridor approximately halfway (100 miles to each) between Dallas-Fort Worth and Oklahoma City. The largest city along the corridor, Ardmore has grown to be a the commercial haven for southern Oklahomans who don’t want to trek all the way to Denton for a better mall. In addition, Ardmore has a very successful, quaint downtown as well as a new big box center in the works called Ardmore Commons. Recently, the mall was purchased by Dallas area-based commercial developer Burk Collins & Company. The developer has made a promise to update the mall with bigger skylights, more stores, and even divulged it was in talks to bring popular retailer Old Navy to the mall. Mountain View Mall will also receive public restrooms for the first time. Wow! 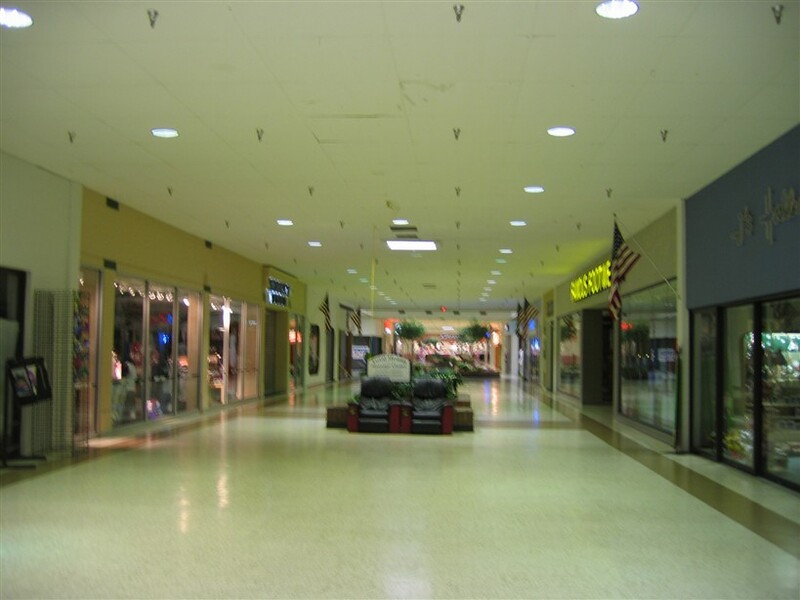 Take a look at these photos I captured of Mountain View Mall in July 2005. Note the dated decor and although the mall is only 217,000 square feet, it definitely felt a bit larger. The Hoe-Downs and community spirit throughout the center reinforce that the mall is definitely not forgotten or even close to being a dead mall. It thrives as both a retail and community gathering place, and hopefully the developers will realize the potential of the mall and max it out instead of allowing the mall to lie fallow. Do you have anything to add here? Maybe you know more about specific stores that have been in the mall throughout its history, or even some important dates. Feel free to leave a comment or two and let us know! The Staples looks like it was a Winn-Dixie store originally. If I remember correctly, the Hobby Lobby/Goody’s is either a former Kmart or former Wal-Mart. That’s one of those things I miss about malls. The sense of community involvement. 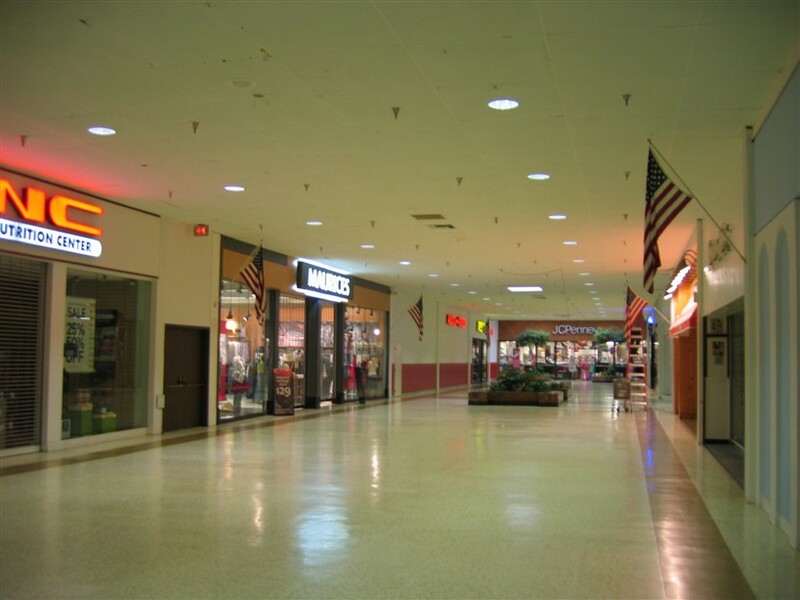 This was what kept the smaller malls of this type alive and well back then, and still does today for some of the more out-of-the-way malls like this one. That JCPenney down at the end in the interior shots, i can tell has a wooded front, so this mall seems to have been built in the middle or latter half of the ’70s, maybe even up as far as 1980. 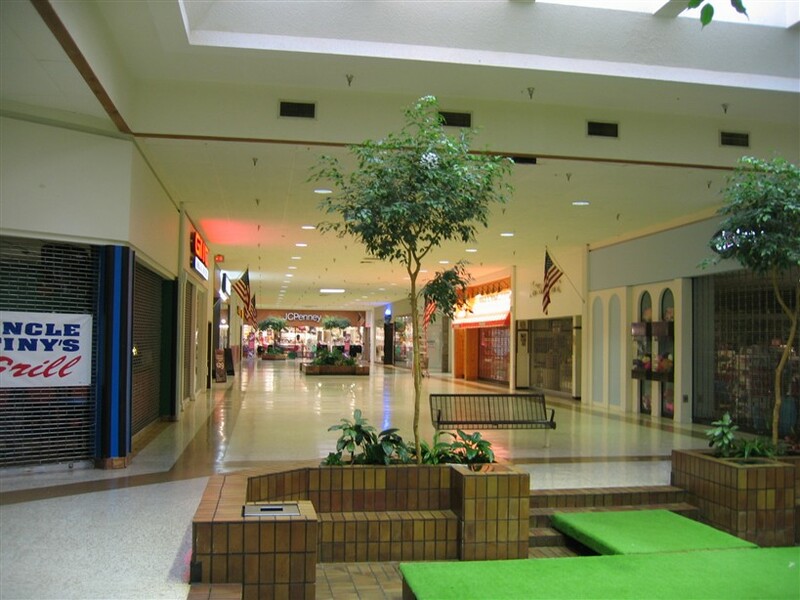 Smaller towns (25,000 and under) wanted in on the ‘enclosed mall’ fad, so many got them…abelt, in a smaller package. A wild guess, but I’d also be willing to bet that Hobby Lobby was once a K-mart. They, and other regional or national discount stores, anchored a lot of these kinds of malls. Mountain View Mall opened in 1980. 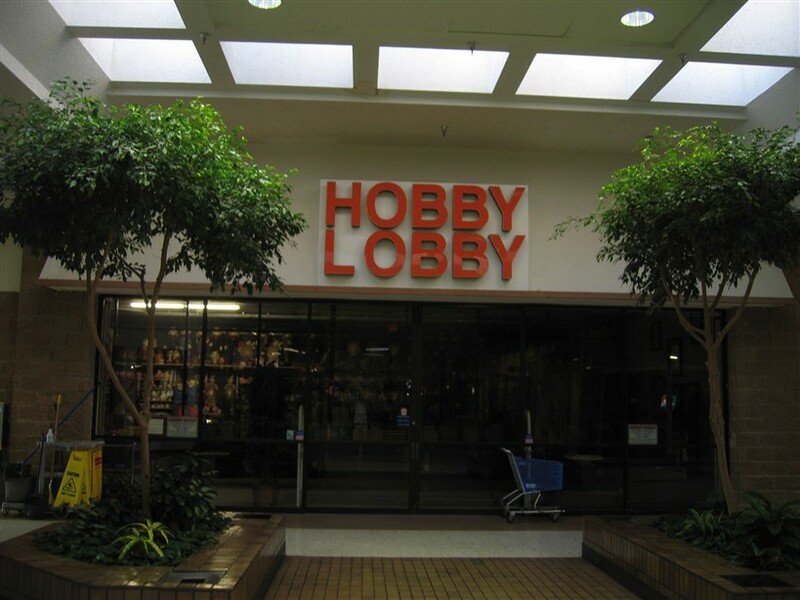 I found some archived images that seemed to show that the Hobby Lobby was once Kmart; that and the Hobby Lobby/Goody’s space matches the size and shape of a Kmart. I can’t believe they still have a Peanut Shack! What was Peanut Shack? This is the only one I’ve ever seen/heard of. Peanut Shack was a chain of candy and nut stores that was at least regional. Their heyday was the early to mid 1980s (as you might guess by the vintage late ’70s design cues). They started closing en masse about 15 years ago, but you still see a few in smallish malls that haven’t been updated. I grew up in Ardmore but now live in suburban Dallas. Mountain View Mall was originally supposed to be sited about 1 mile north of its location, with a view of the Arbuckle Mountains to the north, hence the name. At its current location, the mountains are not visible. The mall opened in 1980, with some of the pad sites opening slightly earlier. If I remember correctly, Burger King was the first to open on the property. The Staples was indeed a Winn-Dixie supermarket at one time, with an Eckerd’s next door. Winn-Dixie built a new store 1 mile to the south about eight years ago, consolidating their two stores in town at the new location. Staples moved in. Hobby Lobby takes up about 75% of an old K-Mart space. K-Mart pulled out several years ago, as Wal-Mart killed many retailers in the area. The rest of the space is occupied by Goody’s. 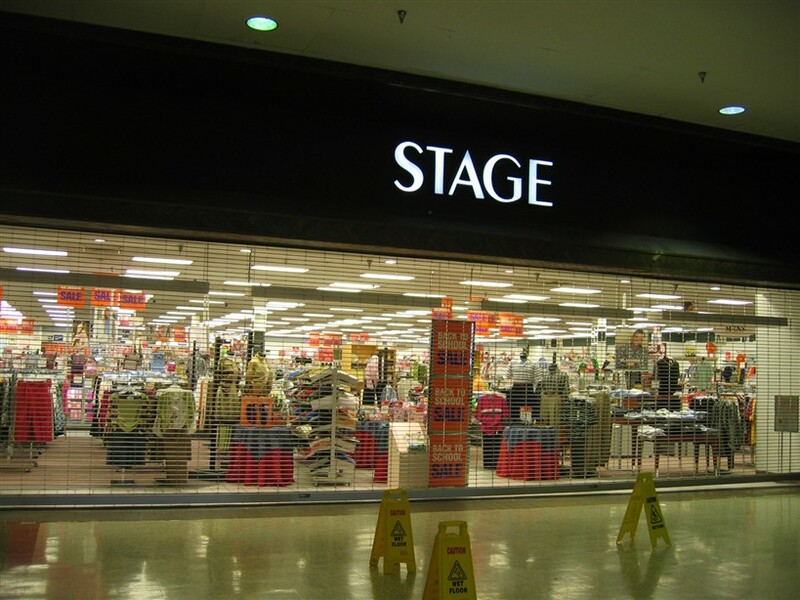 The Stage store was originally Beall’s, one of the few outside Texas. The name changed when Stage bought out Beall’s and CR Anthony (an Oklahoma chain of mid-priced clothing) and merged them. Beall’s name is now only in Texas, I believe, and primarily in small to medium sized markets. Prior to this location, Beall’s was in the old Ardmore “mall”, which was really a strip shopping center with an enclosed, air-conditioned walkway connecting a few stores. Montgomery Ward had a store here from the late 60’s and remained in this location until the entire chain closed. The Peanut Shack has been there since the mall opened, in the same location and with the same ’70s decor. It’s one of the few smaller stores that remain from the original mall tenancy list. JCPenney opened with the mall, and moved from an historic building downtown. Its downtown location was next door to a Woolworth’s. Both buildings are now gone, having been lost to a fire. The central court had four stores the corners. Two of them were jewelers: Gordon’s and Zales. Both are now gone. This town at one time was one of the wealthiest per capita on the planet, thanks to oil discovered in the area in the 1920’s and 1930’s. The town housed the bankers, engineers, geologists and lawyers. Most of the field workers resided closed to the oil fields (about 15 miles to the west). There is still a lot of money there (one local foundation has assets in excess of $1B, with another holding more than $250M), but many of the oil families have scattered to Dallas, New York and beyond as their interests are not in the oil patch. There used to be a lot of local shops and retailers, and an somewhat upscale local department store (Daube’s). Unfortunately, much of this is lost as people today favor large chains and a lot of local people shop in Dallas or Oklahoma City, the fringes of each being only an hour away in either direction. And, of course, Wal-Mart has taken its toll, especially on grocers. I lived in Ardmore from 1984 – 1986. I was very young at the time, so unfortunately I don’t remember very much about this mall. I do remember TG&Y and going with my family to a mall in Dallas quite a bit. Ardmore was also where we discovered Wal-Mart, virtually unheard of at the time. Thanks for this feature. That Sirloin Stockade restaurant looks like a former Ponderosa or Bonanza. Theshape of the sign is Ponderosa-like and the building style is more Bonanza. @Patrick, I currently live in Ardmore and have all my life. I’m 32 and remember when the Sirloin Stockade was indeed a Bonanza. I’m from Oklahoma City and on the way to Dallas I’ll sometimes stop in Ardmore for a bit. I’ve been down that street a hundred times in Ardmore where the mall sits. I recall noticing the anchor stores, but I never realized that there was an enclosed mall inside! The SIrloin Stockade was a Bonanza originally. It didn’t last too long, about a couple of years. This restaurant is the same concept, and it moved from a location about 1.5 miles away, closer to downtown. That old Sirloin Stockade restaurant is now a furniture and appliance store. The Marshall Mall is almost exactly the same: even the main entrance is the same. It looks like there was a K-Mart at one end, JCPenney on the other and Beall’s in the middle. Mountain View Mall was set up in teh same way. In Marshall, JCPenney and Beall’s are still located in that mall, but not much else. I didn’t have a camera at the time, or I would have taken photos. The mall in Marshall is not faring as well. Marshall is about the same size as Ardmore (24,000 people), but it is closer to “big” cities like Shreveport and Tyler & Longview TX, so I’d imagine most people in Marshall think nothing of driving to either city for serious shopping. It doesn’t have public restrooms? Yuck! @Jonah N., There are public bathrooms inside the JC Penny’s, Stage, Goody’s, and the Chinese Resturant; But unlike the majority of large city malls there are no restrooms in the hallways. 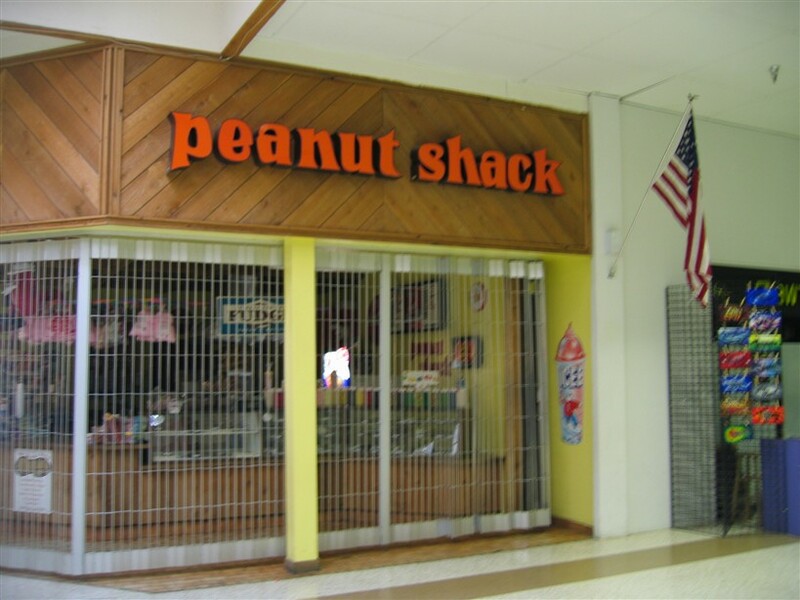 My local mall in central Texas used to have a Peanut Shack, but by 1995 it was long-gone. The food court had been invaded by other stores (Gymboree, American Eagle Outfitters, etc.) The food court once had 14 stores, now it has 7. As for Bealls, it is found in virtually every mid-range mall in Texas. It is always considered a full anchor, and it is unrelated to the Bealls in Florida. That has got to be the oldest Hobby Lobby sign I’ve ever seen! There are restrooms in JCPenney’s & Hobby Lobby. My Aunt is the manager of the mall and told me the same company that is building the strip mall and new movie theatre out by I-35 also bought out Mountain View Mall and plans on renovating it. I too was in was in Ardmore in the eighties I remember how nice that mall was. Last summer I was there for the first time in over 20 years and it was not quite the same. But I guess nothing is. Any one know what happened to Benson’s Steakhouse? The Peanut Shack looks like the Peanut Shacks in the Carolinas around 1980! I have also lived in Ardmore my entire life. I also agree that people seem to have the wrong perception of us. There are public restrooms to use. I also think it’s good that there are community events held there. I was born in Ardmore and as a kid this place used to be the hub of all things cool and trendy from 85 to the early 90’s. I never would have thought a tacky retail monstrousity would hold so many memories. I have lived in Ardmore my entire life and I have never been to or heard of a “hoe-down” at the mall. You make us sound like total hicks. By the way, the census for 2000 showed a population of 33,285 and we’ve grown quite a bit since then. Where do you get your facts? Why did the peanut shack die out of business, did people stop eating peanuts and the snacks they offered? what was the name of the popcorn place that was in there about 20 yrs ago? A “sister” mall was built by the same developer in Pampa, Texas, in the Panhandle about 50 miles NE of Amarillo. 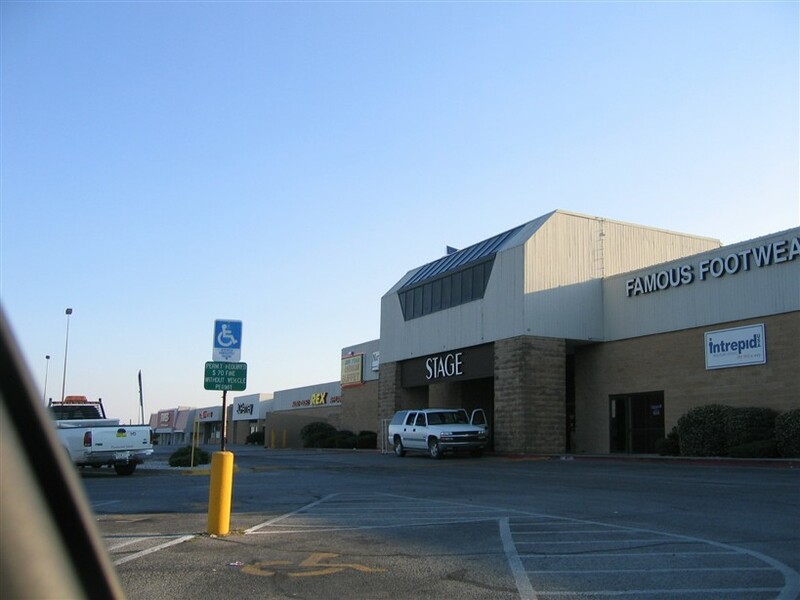 The “Pampa Mall” opened about the same time, with the same anchors (JCPenney, Bealls, KMart), but had Safeway and Revco as the grocery and drug store at the south end of the mall. It also had the very same main entrance canopy with skylight aboe, and the same center court with recessed seating, fountain, and a “ring” of skylights above. The mall was originally designed for 40 stores, including the anchors, grocery and drug store, but never had more than 30. Sadly, after the oil bust of the late ’80’s, Pampa lost 30% of its population. The mall has been completely empty for more than a decade now. Bealls relocated to a former CR Anthony location in a different shopping center, and JC Penney and KMart closed. The great irony is that WalMart relocated from their smaller store a few blocks south, building a large Super WalMart just north of the mall. I grew up in Ardmore when I was very young and that mall has changed a lot! The Hobby lobby was an old “Wal-mart” if I recall, It use to have a “Hastings”, there once was a fountain inside, it use to have an “Aladdin’s Castle Arcade”, and once had a great burger/hot dog diner inside. I can’t recall the name of that joint. Looking at it now makes me sad. It’s old and needs a lot of TLC. Ardmore needs to give it a well deserved make over and help save it from going extinct. Hobby Lobby was K-Mart, Pronto Print was at the entrance on the north. The Hastings that was where the Nutrition place is now was Actually a Music store before Hastings, That sold a ton of Vinyl over the years. Can someone name it? Aladdin’s Castle Arcade was great before the Cnl Bills open downtown area. There were also “sisters” to Mountain View Mall in three South Dakota towns (Brookings, Huron, and Pierre); Jamestown, North Dakota; and Glenwood Springs, Colorado. All opened with the same external architecture, and smaller J.C.Penney and Kmart stores on each end. The malls in Jamestown, Pierre, and Glenwood Springs are in far better shape than Mountain View – J.C.Penney and Kmart remain in them and occupancy is greater than 90%. The sister malls in Brookings and Huron are in far worse shape, with only one anchor (Kmart closed in Brookings and JCPenney closed in Huron) and about five stores. @TSEliot, The ones in the Dakotas all had Spurgeon’s instead of a Bealls brand. The JCPenney/Kmart/Spurgeon’s combo also showed up at a few other malls, such as Copper Country Mall in Houghton, MI, Irongate Mall in Hibbing, MN, Hutchinson Mall in Hutchinson, MN. All three replaced the Spurgeon’s with Jo-Ann, which is still open at the two Minnesota locations. Houghton’s Kmart became a Steve & Barry’s (!) and is now closed, and the mall has maybe 6 tenants left. Irongate still has a vacant Kmart, very few inline tenants, and Sears Dealer and Peebles taking up large chunks of space. Hutchinson’s Kmart was later a furniture store and is now a Runnings. The hastings was where the REX was, but sadly it has left as well. The CVS is now an Aaron’s Rental Store. The hot dog place they were talking about was Alettia’s Dogs and Spuds. The Stage has moved to the Ardmore Commons as well as the Hibbet Sports. The Goody’s has closed (as the chain went belly up) but they are currently gutting it to put in a Big Lots which should do well here. Given all the above, the vacated Stage Anchor location is the only vacant anchor. With the Big Lots coming in, maybe some of the other smaller slots will fill as well. The place really fills nicely during christmas as several temporarly outlets come in. Interesting. The old Stage became a new Goody’s. 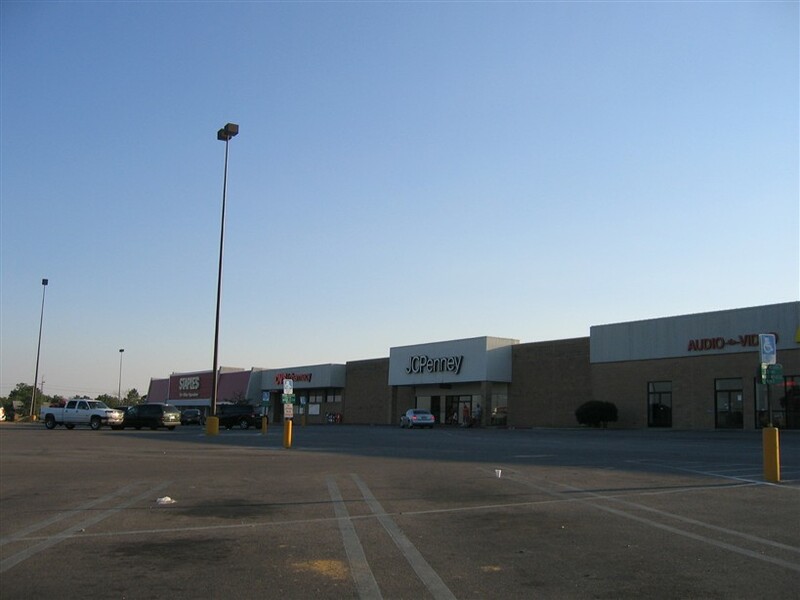 The Hobby Lobby was a K-mart, The Goody’s is now a Big Lots, The Claires (center picture far right) was once a cafe (or maybe that was the cell phone store, I can’t remember), the Hibbet was a hair saloon, the Staples was once a Win Dixie, the former Alettia’s Dog and Spuds was an A&W also (pictured center on the far left) The Rex was an old Hastings Video, and the Bath And Body Works used to be a CATO. Also not pictured in the main entrance is a former Living Word bible store, a Chinese resturant whose southern half used to be a dress store, and an Aladdin’s Castle arcade that’s went out of business a long time ago but the store has remined empty sense do to bad lighting. My father managed that arcade until I was about 11 or 12, which is why I remember all this. Just to correct myself, the Aarons is the former CVS. Rex is now where the Hallmark is. Lived around Ardmore all 33 years of my life and I was recollecting about Mountain View Mall with my son a couple weeks back. The hot dog place was called Carousel. Zales and Gordons were the jewelry stores in the center. There was a sport card shop called The Batter’s Box at the center entrance. Across from it were two clothing stores–Reba’s and Ana of Italy’s—this is now JingYuan Chinese Buffet. Then there was Alladins Castle. Across from there was Hair Pizazz. Had a Waldenbooks, Hasting’s, Stephanie’s Boutique, Buckle, Athlete’s Foot, K-Mart, Cato, JCPenney, Bealls, Peanut Shack, Armed Forces Recruiting, Regis Hair Salon, and it seems like there was a Radio Shack on the south end next to Penney’s. I lived in Ardmore a good part of the 80’s. It was really a very nice town. The mall also had a post office branch on the north end and later (I’m fairly sure) became the location for Armed Forces recruiting. I had a P.O. Box there for about 4 years. The drug store was originally an Eckerd Drug and im thinking might have even carried the Treasury Drug name for a short while. The mall really took a toll on downtown Ardmore’s retail, but that pretty much happened everywhere when the malls came in. I’ve always thought that outside of Tulsa and the OKC metropolitan area, Ardmore, Bartlesville and Ponca City were the classiest towns in the state. Ardmore is the only one that didn’t lose major employers in oil & gas and is still a solid town. Lots of memories. Another “sister” mall was built in Palestine, TX, as well … Same architecture/anchors/everything. This mall has changed drastically since this review. The developer of the newer Ardmore Commons bought this mall and is in the process of renovating it. The painted wood facade is gone, replaced with stone. The long vacant Alladin’s castle location is the location of the new public restrooms. The skylights have been replaced with dome ceilings. The fountain and planters have all been removed…presumably to open up the walkways and provide more booth space for the holidays. Much of this developement was due to some tax incentives. It basically called on Burke Collins to spruce up the place, put in public bathrooms, provide Staples a smaller location, bring in TJmaxx and finally bring in an organic grocery store. The bathrooms have been installed, Staples is now in the old Hastings/Rex location (expanded out the front) with hallmark next door. Ying Yuans now has an external entrance, and TJmaxx is currently renovating the old Staples/Winn Dixie location for it’s future store. The site plans on the Burke Collins website show the un-named grocery store locating to the South of the new TJmaxx location, but no progress has been made on this. Also, the dated marquee signs have been replaced with newer stone signs. During the sign installation, the signs were topped with the heading “The Shops at Ardmore” (or something similar). This text is now covered by tarps. 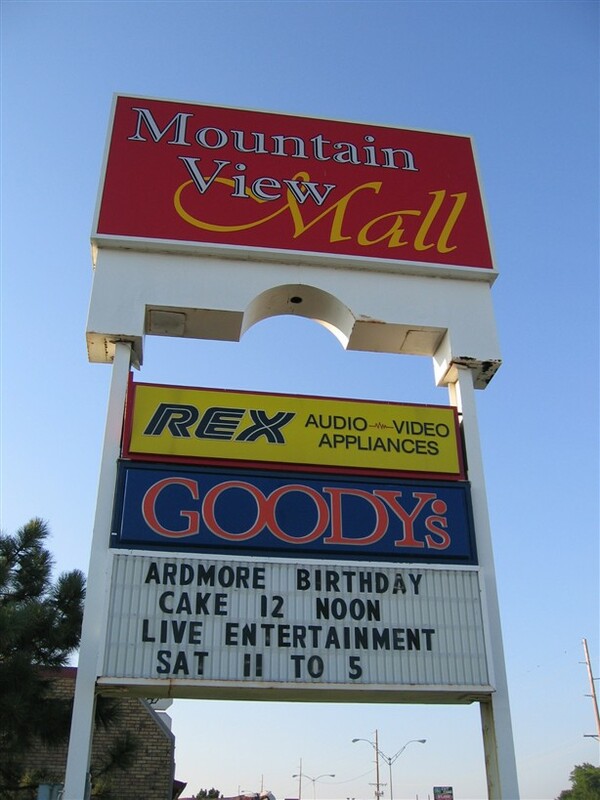 Presumably, during the relaunch, the Mountain View Mall moniker will be retired. With all this developement, and all anchor pads occupied, hopefully some new permanent inline tenants can be attracted.